From high-tech stealth bombers, to the latest night-vision rifles and assault helicopters, the U.S. armed forces have the most sophisticated military hardware in the world. Here are some of the niftiest pieces of equipment used in recent missions from Operation Odyssey Dawn in Libya to the Osama bin Laden raid in Pakistan. 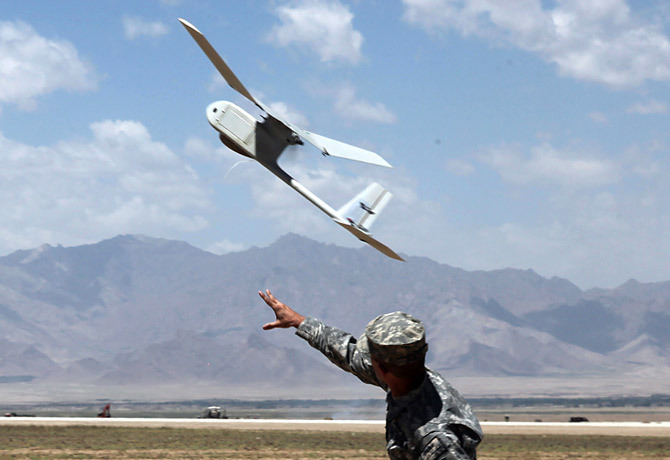 The Army is flying a growing fleet of hand-launched RQ-11 Raven drones over Afghanistan. The 4.2-pound (1.9-kg) aircraft is simply tossed into the air with its battery-operated prop spinning for flights of up to 80 minutes at 30 miles an hour (45 kph). It transmits color video or infrared imagery to the operator's laptop up to nine miles (15 km.) away. These drones protect bases and convoys. But they're increasingly deployed with small groups of troops, who use them to scout out territory and peer over hills before the grunts get there. They're also being used to monitor roads and detect roadside bomb-planters. The $50,000 drone has a 4.5-foot (1.4-m) wingspan and troops like the security of having an unmanned aerial vehicle scout unfamiliar terrain from high above, instead of having one of their own walk the point. "It's rucksack portable," says Army Sergeant First Class Jose Blanco. "We have to carry it across mountainous terrains for long distances." The Raven, built by AeroVironment of Simi Valley, Calif., has only one downside. Blanco recalls a training mission he was on when his unit spotted fellow GIs in trouble via the drone's camera but were too far away to do anything about what they saw. RIGHT "Another group of soldiers came into contact with the enemy," he says. "We were at the max distance of our aircraft...I'm going to tell you from being there and doing it sometimes you get to see what's on the ground and what's going on live and then you realize it's not a game, it's the real deal. You want to jump into the fight and you can't do it...It's bad when you're looking at it at the screen and you're looking at other soldiers getting shot at." For the inside story on America's military operations around the world, check out Mark Thompson's blog, Battleland: Where military intelligence is not a contradiction in terms.